Hello! My name is Marci. That’s me on the left. The guy on the right is Steve. He’s my husband. 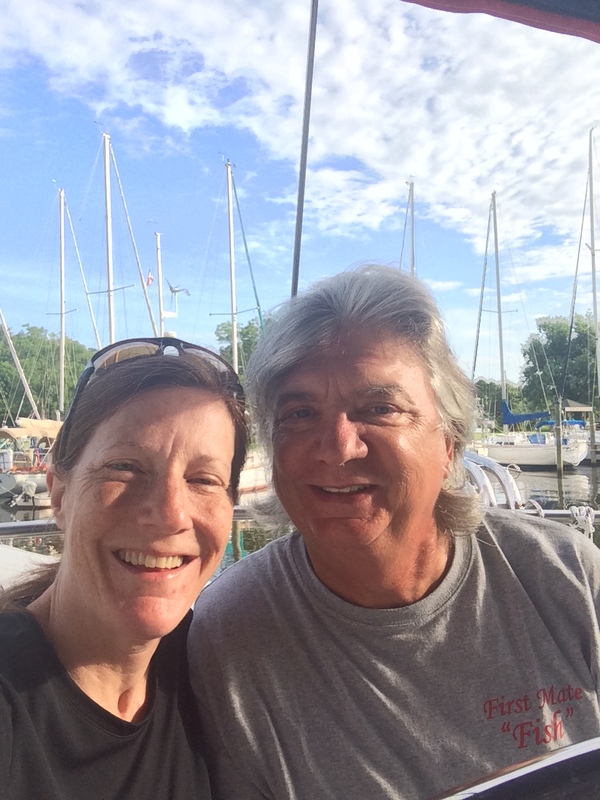 In 2015, Steve and I got tired of working so we quit our jobs, sold our home, got rid of most of our stuff, and moved aboard FNR, our 33′ sailboat. Sadly, Steve got sick and almost died not once, but TWICE! We bid FNR a bittersweet farewell and moved back on land. Happily, Steve got better so we bought a camper, and we’re our way to the Grand Canyon with Cal the Schnauzer, and Trixie the Chiweenie. Hey guys! Glad to see Steve is better. This is Matthew aboard Sv Warm Winds. Previously FNR. 🙂 The boats has had alot of upgrades, new bottom barrier coat, new sails, done away with in boom furling and added 300 watts of solar. We’re currently in Titusville FL provioning for a 2 month trip to abacos Bahamas. Mathew: So good to hear from you. Steve and I are really, really, really happy that FNR is still loved and being well taken care of. I know she’s ready to see some blue water. Safe travels and please stay in touch. Bill: Thanks for reading! It has certainly been quite the adventure!! From teenage girl to grandmother, I’ve got lots to smile about!! I just came across your blog today. Browsed through a bit. Looks like you’re doing well living aboard your boat. Looks like a lot of fun moments, good and not so good but it’s all memorable, right? I’m in the middle of a refit of my boat so it’ll be quite some time before I get to sail it again. I enjoy seeing what others do on/around their boats. Thank tot so much for checking out SailingChiron.com. We are new to WordPress but there will be lots more to come. Send us a note if your Chesapeake Bay trip comes to life, especially if you make it up the Potomac River near DC. We’ve got room at the marina, great facilities and lots of docktail parties left in the season. Tiffany: Thanks for reading Zen on a Boat. I am looking forward to reading about your adventures. Rest assured, you’ll have lots to blog about. We were on the ferry to Ocracoke this spring. Think you sailed past us. We waved and hollered! Stay in touch. You are living the dream! Carol: Good to hear from you and thanks for commenting! Hope you are Bryan are doing well and enjoying the blog! We are most definitely living the dream. What’s next remains to be seen. Life’s always an adventure with Steve. Lots of luck to you. Keep us posted. Wow. Hope I get to do that someday. Yes some people do call it crazy but not me.